Greaves Tame New Red Bud Track, Leave with Pro4 Tie. 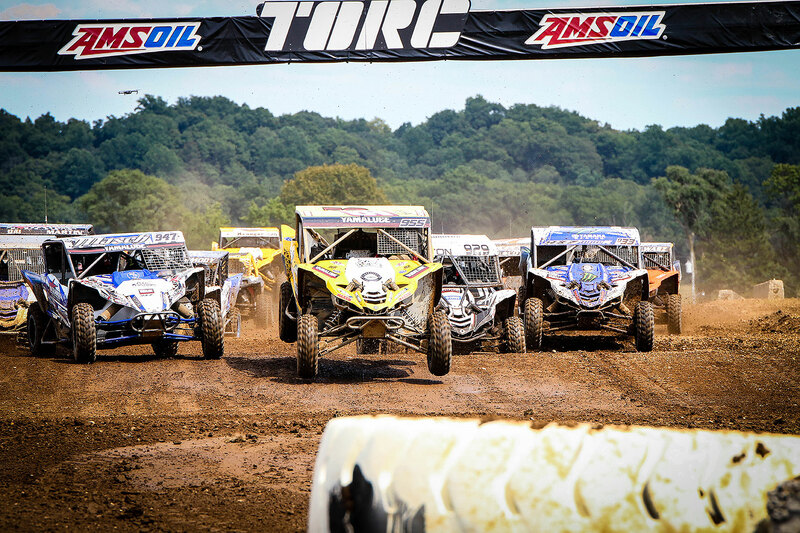 TORC–The Off Road Championship headed to a brand new track in Buchanan, MI at the famed Red Bud MotoX park for rounds 9 and 10. The green track was like a bull that has never been ridden: wild, crazy and unpredictable. The track, specially built for TORC, is adjacent to the track with the most famous dirt bike jump in the world–RedBud’s awe-inspiring LaRocco’s Leap. 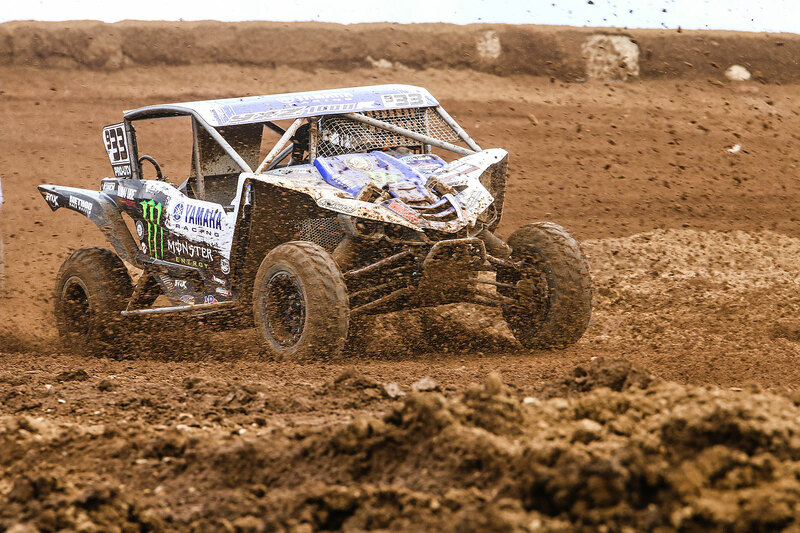 The Greaves Duo and the Yamaha UTV team left the weekend having tamed the new track, sporting a lot of hardware. For the second time in so many months, the Greaves Duo emerged from the weekend of Pro4 racing in a virtual tie in points. Johnny overcame a early race spin-out to finish 2nd in Saturday’s race. 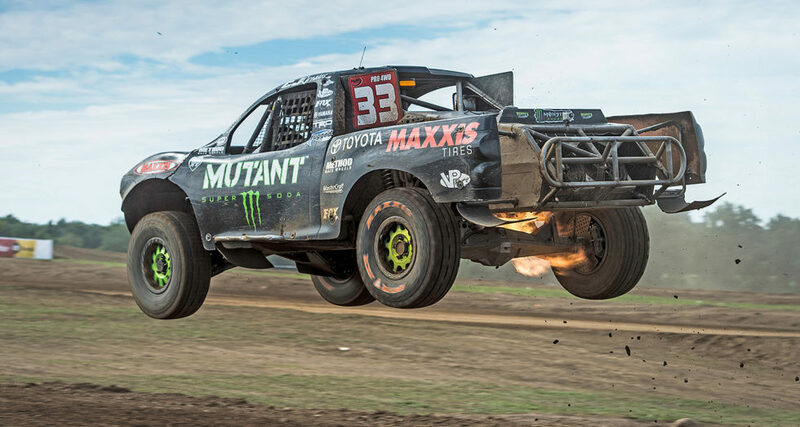 CJ Greaves, after running his Monster Energy/Mutant Soda Toyota in the top 3 most of the race, ended up in 4th due to a mechanical issue. 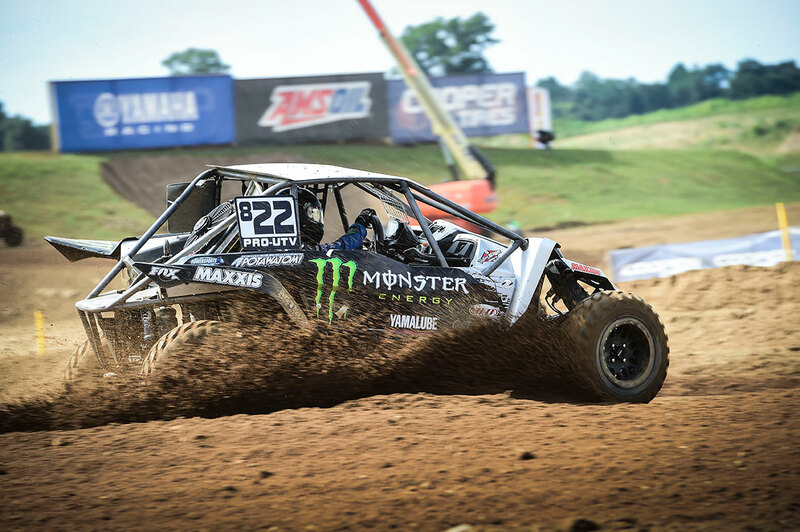 CJ won all 3 races he was in on Sunday by continuing his unbeaten streak in his Monster Energy/Yamaha Pro Stock UTV. He also made his Pro Mod UTV debut and proceeded to take a 2nd place on Saturday and his first win on Sunday. He also took his 5th Pro4 win on Sunday. That moved him into a tie with the senior Greaves. Johnny amazingly mustered a 3rd place finish on Sunday after having to change 2 tires during the competition caution. Jake Lunderby had a breakout weekend in his Yamalube/Maxxis Tire Yamaha. He took a hard fought 3rd on Saturday and came about 4 turns shy of a win on Sunday after leading almost the entire race. A small mistake was all it took for CJ to steal the win. 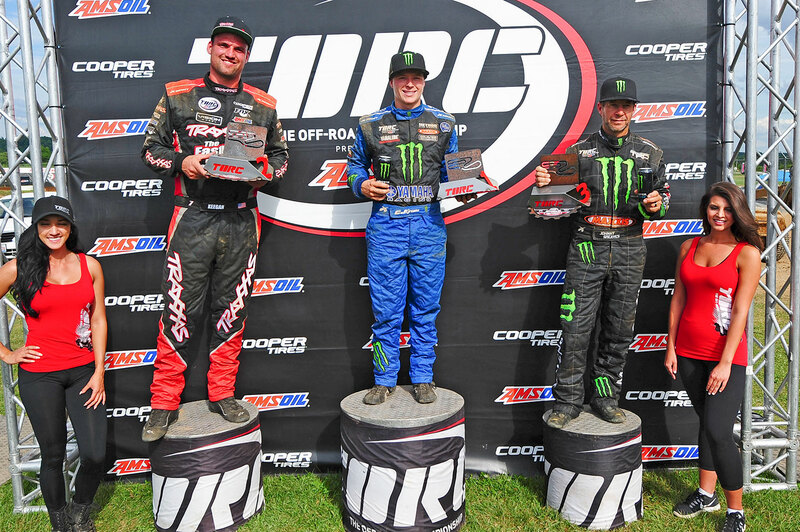 Rodney Van Eperen also turned in a stellar performance, putting his PowerSports1/Maxxis Tire Yamaha atop the podium on Saturday and overcoming a power steering issue on Sunday, finishing 3rd and keeping him close in the points standings. First up to try to tame the “best dirt in the country” were the Pro Stock UTV’s. CJ Greaves battled with Martin for the lead most of the first half of the 10 lap race. On lap 4 the top 2 went side-by-side, but CJ was not able to make the pass. They were nose-to-tail all the way to the competition caution. 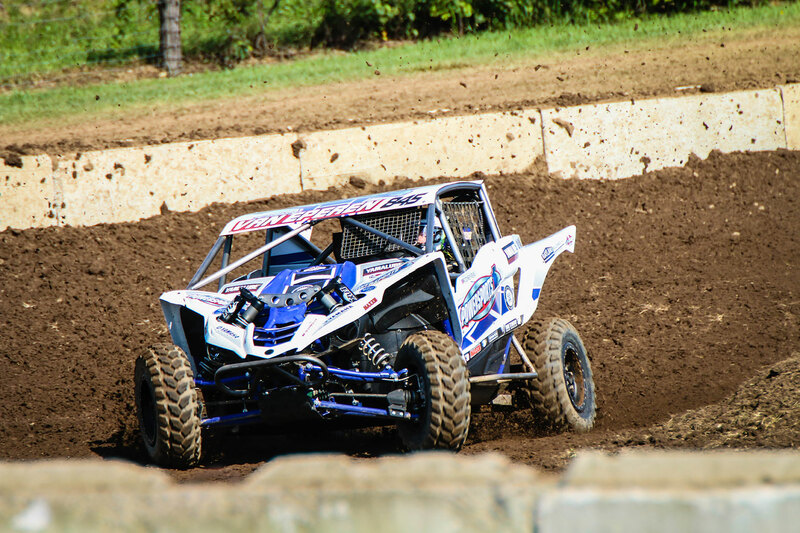 Jake Lunderby was in 4th at the mid-way point of the race with the top 7 UTV’s being Yamaha. On the restart, CJ continued to stay with Martin, waiting for the slightest mistake. With 3 laps to go, the mistake came and CJ took advantage to move into the lead. 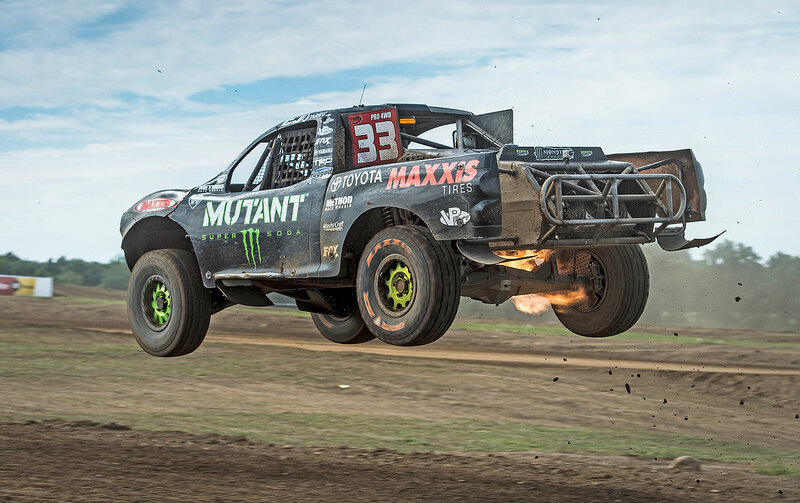 The battle was not over though, Martin was half a car length on CJ’s Monster Energy Maxxis Tire Yamaha. But CJ was flawless and cruised on to victory. Jake took his Yamalube/Maxxis Tire Yamaha cross the line in 3rd. CJ Greaves joined team mate Rodney Van Eperen for his Pro Mod UTV debut on Saturday. Rodney continues to chip away at Kyle Chaney’s points lead having podiumed in all but 1 race this season. With CJ in the lineup, it would add another dynamic to the points battle. CJ started 6th with Rodney starting 8th in the field of 24. Van Eperen was in 3rd and CJ in 5th at the competition caution. The rough track began to take its toll on some of the top contenders in the 2nd half of the race. Zac Zakowski over rotated creating a log jam in the first turn. The reshuffle moved CJ to 4th and Rodney to 2nd. The leader, Tim Farr, pulled off the track with mechanical problems, and, after taking the lead, Jason Luburgh’s motor gave way moving Rodney to the lead. CJ also moved into 2nd where they finished the race. Points leader Kyle Chaney came in 3rd. 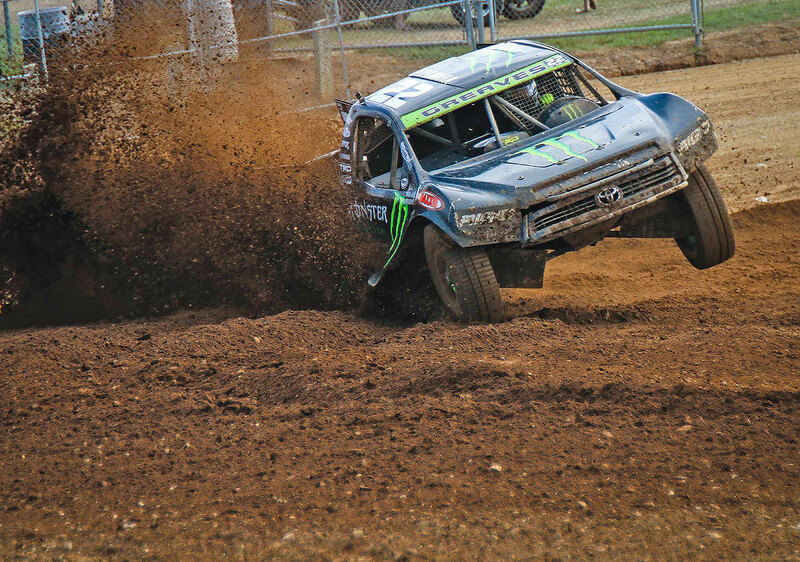 TORC brought the Crandon style landrush start to Red Bud for the pro truck class races. There were 7 trucks on the staggered line for the Pro4 race with CJ and Johnny in the outside starting positions for the 11 lap race. When the green flag flew, the field made the very short dash to the turn one holeshot. Johnny made quick work of Scott Douglas and took on the leader, Ross Hoek. He emerged in the lead but on lap 3, he over-rotated in one of the many hairpin turns and hooked it right into one of the tractor tire barriers. When he was finally able to right his truck, he had a lot of ground to make up. CJ was patiently working his way up to the front and found himself in 2nd, behind Scott Douglas following Johnny’s mishap. On lap 4, Douglas developed a steering problem. 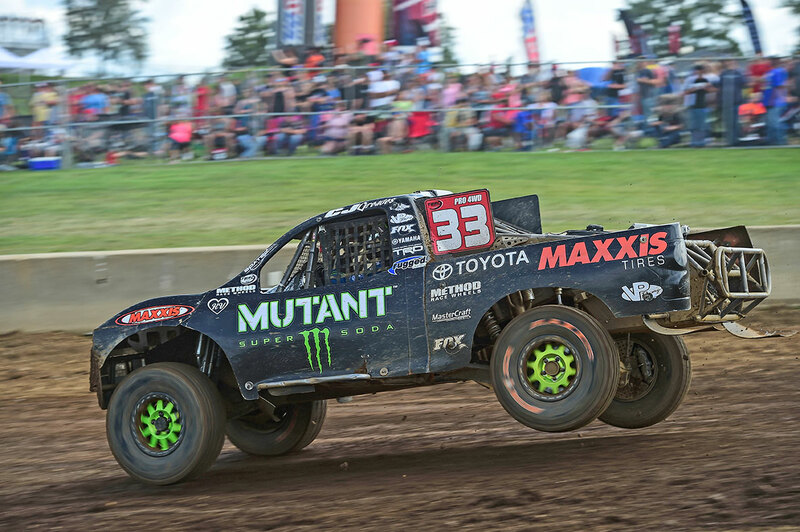 CJ’s Maxxis tires were adjusting to the ever changing track conditions and he took his Monster Energy/Mutant Soda Toyota to the lead with a hungry Keegan Kincaid now in 2nd. Meanwhile, Johnny had made his way back to 3rd by the competition caution. On the restart, Johnny began to battle Kincaid as CJ stretched his lead before a puff of smoke spelled trouble for the younger Greaves. Keegan made the pass for the lead and stretched it out to a comfortable margin. Johnny, with a lot of ground to make up, closed the gap by the white flag lap. He ran out of time however and finished a close 2nd. CJ was able to finish the race in 4th to salvage valuable championship points. Jake Lunderby started on the front row and CJ on the 3rd row for the 2-by-2 rolling start in the Pro Stock UTV class on Sunday. Jake was off to a great start and held his lead all the way to the competition caution, halfway through the race. CJ was in 3rd by lap 2 with Ken Masch between the 2 Yamaha’s. He made a great inside power move on Ken just before the competition caution to move into 2nd. Lunderby had another great start when racing resumed. Now he had teammate CJ Greaves to contend with. 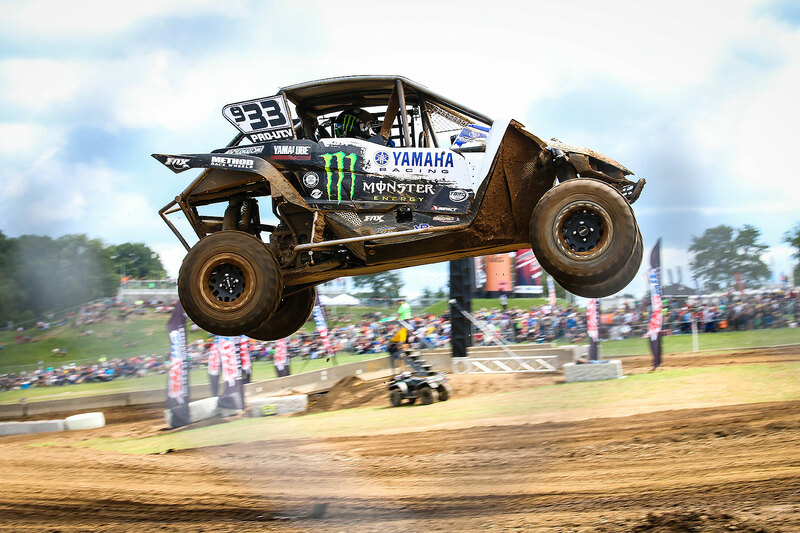 The two Yamaha UTV’s pulled away from the field setting up a showdown in the final laps. With 3 laps to go, Jake entered one of the turns and hit a hole just right to upset his machine, giving CJ the opportunity to make the pass. The 2 cruised on to take the top spots on the podium. CJ Greaves had the luxury of starting on the front row in the Pro Mod class race made up of 23 UTV’s. Rodney rolled off his PowerSports1/ Maxxis Tire Yamaha from row 3–but with a hand full of steering wheel. He lost power steering as they were lining up for the race. This would make for a long and brutal race with a track full of turns and holes. CJ shot out to a huge lead joined only by the 2nd place running Kyle Chaney. The top 2 carried their positions to the competition caution. Rodney Van Eperen was working hard behind them and was managing to stay in the top 5. CJ checked out to nearly a 10 second lead in the 2nd half of the race. He cruised on to the win, with Kyle Chaney coming in 2nd. Rodney was able to endure the steering issues and finished an incredible 3rd! This kept him in contention for the championship as the season moves into the final 2 weekends of racing. CJ and Johnny Greaves lined up 4th and 5th respectfully for the landrush start in Pro4. Johnny emerged from the holeshot in 2nd but before lap 1 was complete, he had taken the lead from Ross Hoek. By lap 2, CJ was also on the move. He made the pass on Douglas for 3rd, making it a 3-way battle for the top spot. Keegan Kincaid and Johnny were racing hard with Kincaid pressuring for the lead. On lap 5, the 2 went side-by-side in the sand pit, making contact in the process. The contact rendered Johnny front and rear flats on the left side of his Toyota. He quickly ducked into the hot pits for the double tire change. With the jack not functioning right and the added load of changing 2 tires, the team feverishly worked to get Johnny back on the track. With the long competition caution, he hit the track just as the field was taking the green flag. Keegan and CJ battled up front with Kincaid taking the lead with 3 laps to go. CJ was all over his bumper though and looking for a way around Kincaid’s machine. On the white flag lap, Kincaid went high on a berm giving CJ the opportunity to make the pass. Kincaid battled back however and retook the lead. 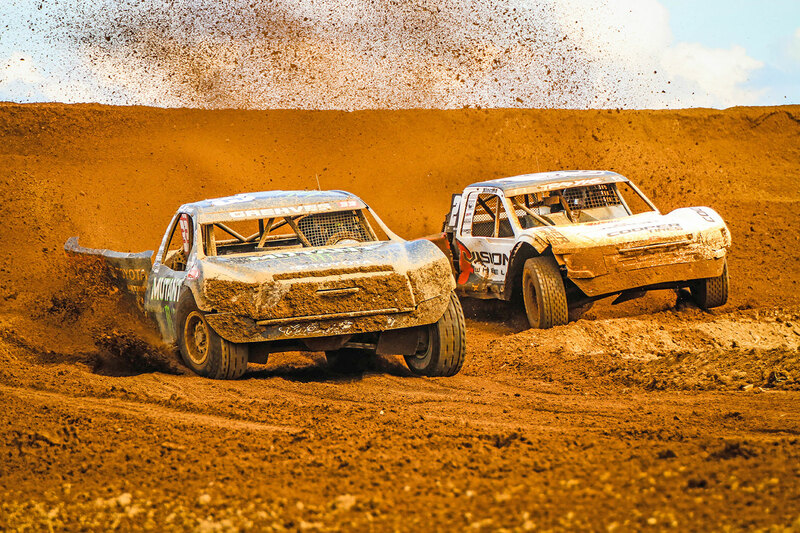 With only 4 turns to go, Kincaid hit one of the many holes that had developed on the track so hard that he stalled his truck. CJ made the pass and took the lead and the win–a Sunday winning sweep for the 22 year old Greaves. Johnny, miraculously mustered a 3rd place finish putting the 2 Greaves in a virtual tie in the points standings. 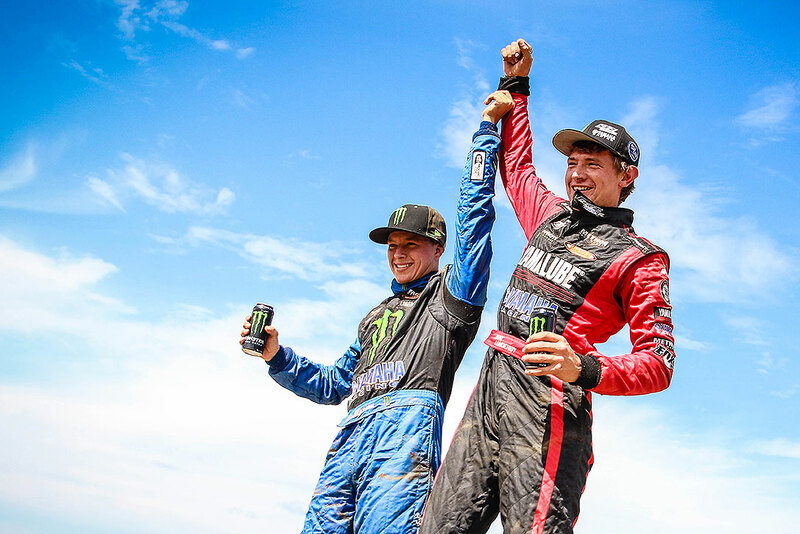 The Greaves Duo and TORC will move to the more familiar confines of Crandon International Raceway for the storied Labor Day weekend of racing. The “Super Bowl” of short-course racing takes place August 31st – September 3rd for 4 days of Sportsman and Pro World Championship races. Sunday, the 8th annual AMSOIL Cup Challenge will pit the Pro4’s against the Pro2’s. 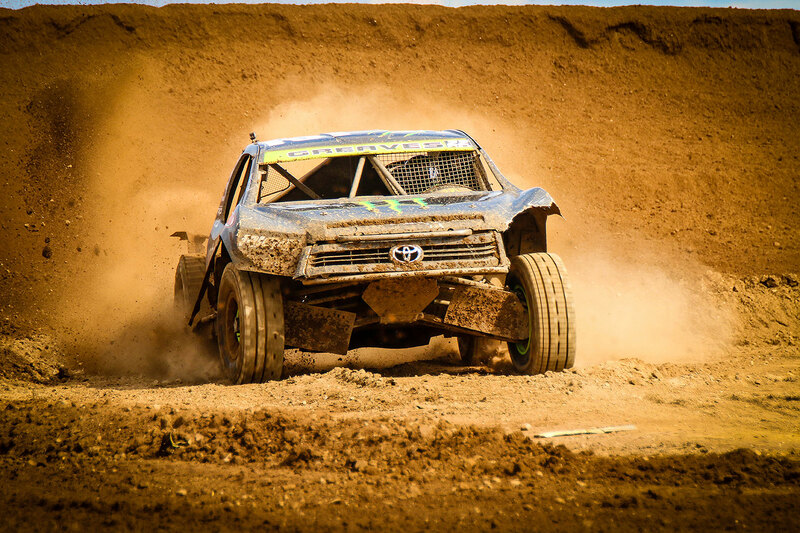 It will be an exciting weekend of racing and can all be seen LIVE on TORC’s YouTube channel. It will also be broadcast on Red Bull Signature Series – a special 90-minute highlight program scheduled to air on Saturday, October 14th at 3:00pm (EDT) on NBC.